by Ludmila Pirogova. Moscow, Interbook Business. 2006. 11" x 9.75". This fascinating book offers not only a stunning collection of works by some of modern lacquer art's legendary artists, but also a revealing glimpse into the social history of behind various styles and themes, with detailed intrerpretations of several works pointing out the social commentary within. Biographical information on the artists featured within helps the viewer better understand the works by knowing their maker. 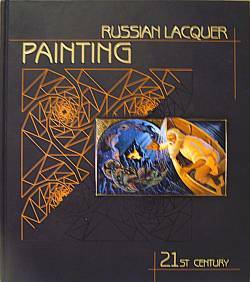 145 pages of color photographs showcase works by top contemporary lacquer artists, including Pavel Anokhin, Sergey Kozlov, Alla Kozlova, and Danila, Denis, Nicolay, and Vladimir Molodkin. 191 Pages.